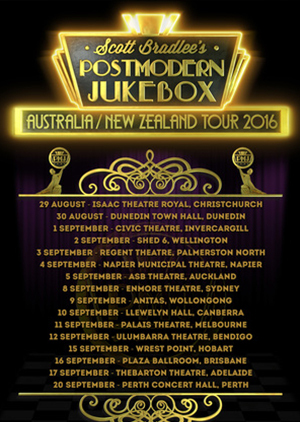 Following their sell-out 2015 tour and upon the request of thousands of fans, Scott Bradlee’s Postmodern Jukebox will return to Australia & New Zealand in August/September 2016 for a national tour. It follows on from PMJ’s current 75-date almost completely sold-out international run, which wraps up June 2016. Created by Scott Bradlee, the rotating collective of Postmodern Jukebox has spent the past few years amassing more than 450 million YouTube views and 1.9 million subscribers, performed on “Good Morning America,” topped iTunes and Billboard charts and played hundreds of shows to packed-house crowds around the world. As NPR put it, they’ve done this by “taking current Top 40 hits and re-imagining them as coming from older eras of popular music.” In one such remake, Bradlee and Postmodern Jukebox turned Miley Cyrus’ “We Can’t Stop” into a doo-wop ditty that’s garnered over 15.4 million views. Last year, they envisioned Radiohead’s alt-rock hit “Creep” as a torch-like ballad that’s racked up over 16.9 million views and was named one of the “9 Best Viral Cover Videos of 2015” by Peoplemagazine. Multi-Grammy winning artist Lorde praised Postmodern Jukebox’s vintage take on her hit single, “Royals,” which has been viewed over 15.3 million times, as her “favorite.” They recently performed a ‘30s jazz remake of Elle King’s “Ex’s & Oh’s” for MTV UK – click HERE to watch.